My kids go to a Montessori school. They were each in Primary this past year, which includes kids ages 3-6, preschoolers and kindergarteners. In the classroom the students have a lot of choice time for work (less so in kindergarten, but it's still there). And one opportunity they have is sewing. 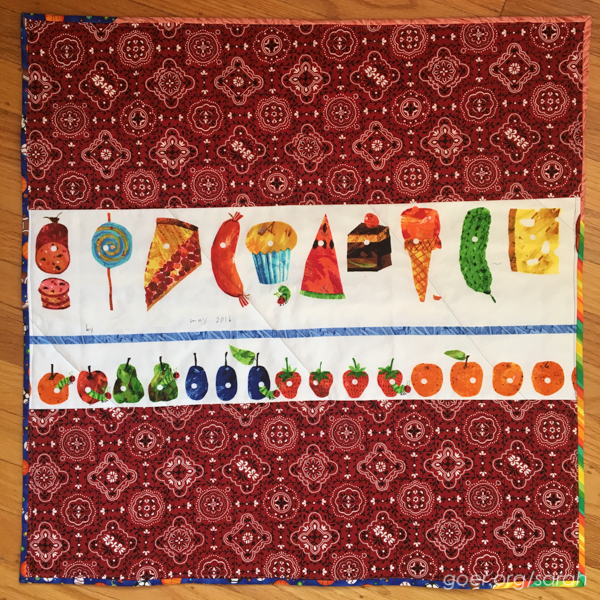 I blogged about my son's sewing experiences as school when we started his first quilt a year and a half ago. My son's first step sewing in the classroom was to stitch using a tapestry needle and embroidery floss in plastic canvas. 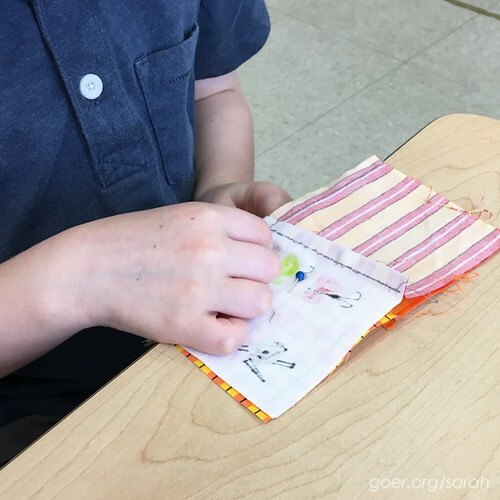 G started at the outside corner and spiraled his way to the center, stitching (with a running stitch) through each square. His second project was to stitch, again with a tapestry needle, on a piece of burlap with a picture drawn on it. (Sometimes the kids like to add sequins when they are stitching.) The third project he did was to make a stuffed bear. For this one he used a woven fabric and thread with a standard (sharp) needle. He used a running stitch, approximately 1/4" from the edge. 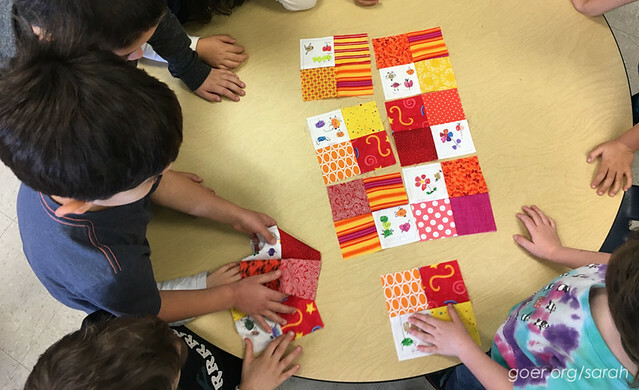 Last Fall, I was asked by my son's teacher to take on the project of making a class quilt with each class of kindergarteners. Um, yes! Of course! I was excited to take on this project with the kinders. The teacher and I met to plan the scope of the project and to set a timeline. There were 9 and 11 kinders in the two classes, respectively. They each had some sewing experience. A few had done all three projects above, while some had less experience. We decided for each student to make a 4-patch block and to personalize their work by letting them do some painting on one white square of fabric. The painting part of the project was done with the help of one of their teachers before I arrived on the scene. She used Ed Emberley's fingerprint book for inspiration and the kids used fabric paint to make their fingerprints, then used fabric marker to draw on the details. Their names were also written on these squares (though I've removed the names from the photos for this post). I began with each group of kinders by sitting on the floor in a circle and sharing a finished quilt and a quilt in progress, so they could see what a quilt was, and what parts went into making it. For the fabric they would paint, I cut the pieces larger and marked their work area with a Frixion pen, then trimmed them to size after they were painted. 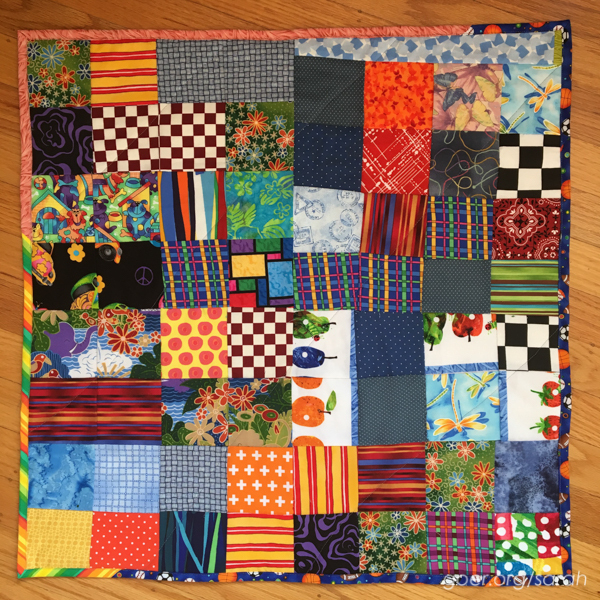 I pre-cut a variety of colored fabrics from the scraps in my stash into 3 1/2" squares and decided that one class would use warm colors and the other would use cool colors, both so that the two quilts would look different, and so that each would have some cohesion within it. This sparked a discussion with the kids about warm and cool colors during my initial quilt talk. Then I spread out the fabrics on the floor and we went around the circle three times for each child to choose their three pieces of fabric to accompany their painted square. At this point I worked with kids in smaller groups (4-6 at a time) to get them started on their stitching. We determined that it was easiest for the kids to have their squares pinned together and to have a line drawn to stitch on. (Some preferred lines on both fabrics, front and back.) Oh, they also like their thread tied onto their needle, so the needle doesn't easily slip off when they pull too far. One class seemed to be a little more self-motivated than the other. I ended up checking in with them regularly, but most made progress when I wasn’t in the classroom. The other class had some more reluctant sewers, so I spent small amounts of time many times a week with them. Some were willing to take only 6 stitches each time I visited. Eventually, everyone finished their 4-patches. Here are a few. We worked as a full group again in each class to talk about composition of the overall class quilt. Specifically, we discussed having the blocks placed so that none of the white squares shared a side, and so no like fabrics were adjacent. In one class we had two students choose three identical fabrics, so we discussed having them placed farther apart so that was less noticeable to the eye. After these discussions, I took the blocks home to press them and machine piece the quilt top. I also did some machine quilting (in the ditch-ish) and bound the quilts using remnant binding pieces. The quilts are now hanging in the classrooms. Here they are! In one class, many students did bonus sewing. Four kids did a significant amount of bonus sewing. One girl has a quilter in the family, so she worked on her project outside of class as well as in class. She didn’t want finishing help and intends to get help from her family to finish her first quilt. Another girl meticulously pieced 24 squares to make a finished 12” x 18” quilt. She hand pieced the entire top. A boy, with the help of a friend, completed a 24" x 24" hand pieced quilt top. There were a couple generous seam allowances and some not quite square pieces of fabric which resulted in the two halves not lining up, so I offered to piece in some filler fabric so we wouldn't have to trim off excess from one half. 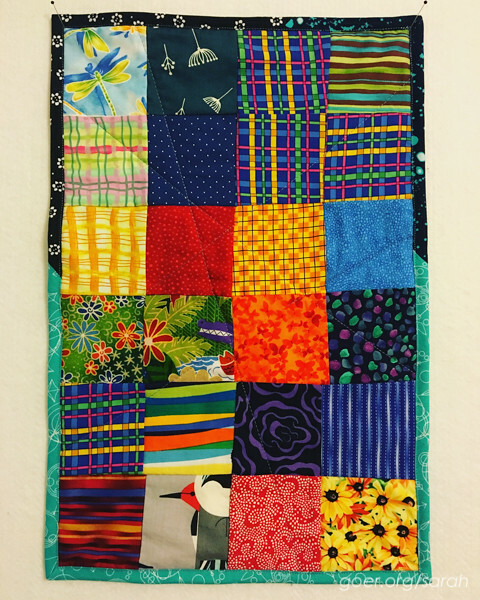 For both students, I pieced their chosen backing fabric, then met with them to label their backing fabric, to work with me to pin baste the quilt, and to choose fabrics from my leftover binding bin. I brought my sewing machine to school so that they could each machine quilt their projects, and I finished the quilts at home by trimming them up and binding them. 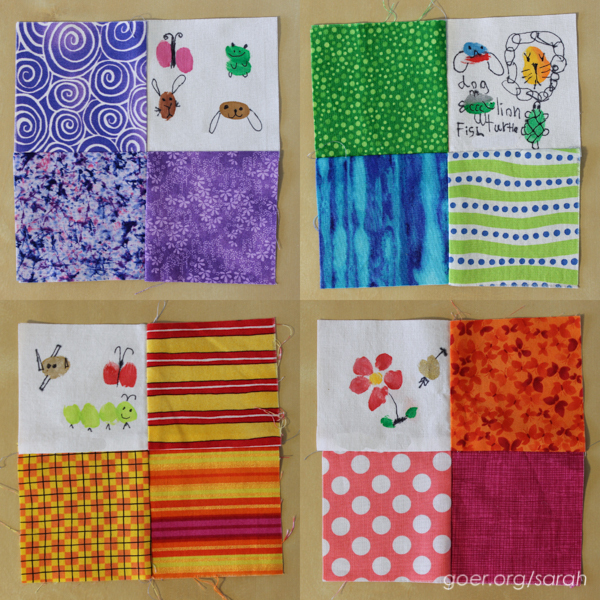 I had a great time working with the kids on the class projects as well as these extra quilts. Unfortunately (for me), both of the students who made their own quilt have moved out of the area, so I won't be able to work with them at school next year. I sure hope that they will keep sewing! Linking up to Needle and Thread Thursday, TGIFF and Finish It Friday. Posted in Quilting. 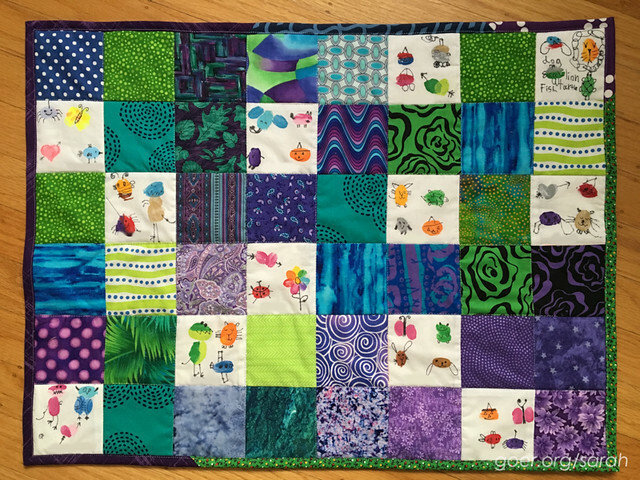 Tags: quilting with kids, sewing with kids on July 15, 2016 by sarah. WOW!! This is so cool!! They really came out beautiful. They must be so proud of their work!! How rewarding for them and for you!! Indeed. Thank you, Bo. It was fun to see how excited they were about the project. This is a terrific project. 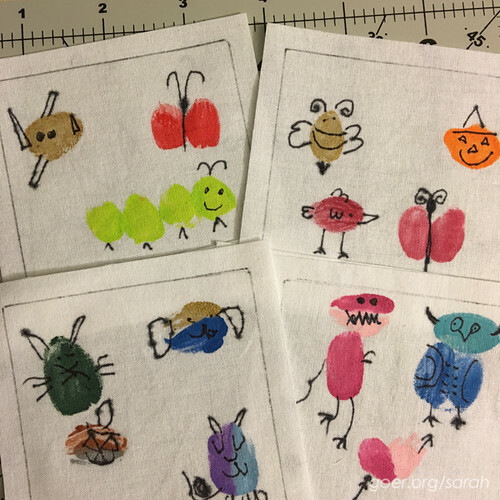 I love the fabric paint idea so that kids have a personal connection to their quilts. What a really awesome experience you gave these kids, Sarah! I love that 2 of the children were inspired enough to make their own first quilts, and the classroom quilts turned out beautifully. It was interesting to me to read that the two classes were different in their motivation to sew. Yay Sarah! It was indeed a great experience for the children as well as the teachers too. It is a wonderful memory I will treasure forever. Thank you, Sangeetha. It was so great to work with you and the kids! That is SO COOL. I wish more schools would teach these skills! Thank you, Alison. I agree. Really fabulous! I love the way you went through the whole process and explained and demonstrated steps to them; that seems like a great way to approach it. All of the quilts came out really great. 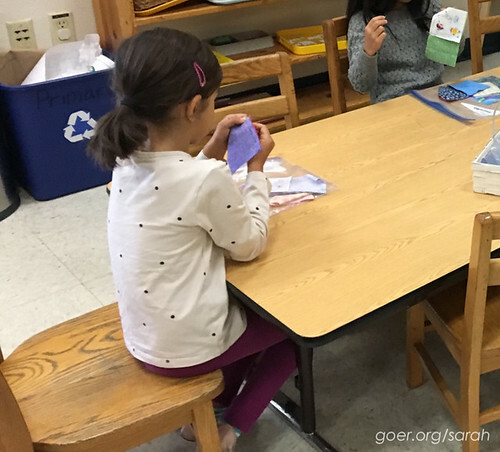 Both my granddaughter and my grandson attended a Montessori preschool school and it was a wonderful experience for both of them, but I live hundreds of miles away and couldn't get involved with any of their activities. 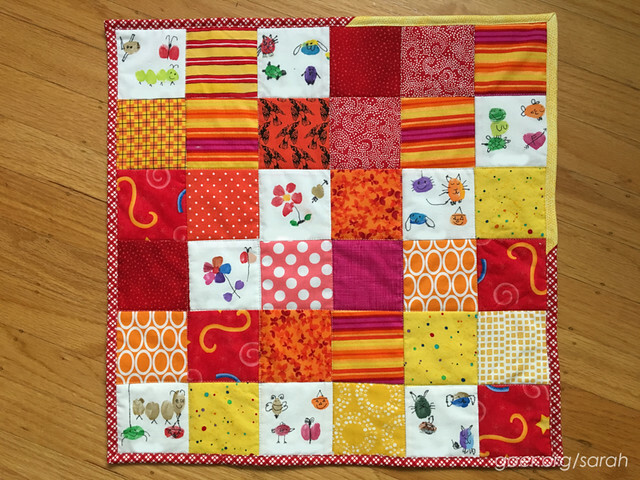 You did a great job in helping the students to learn to sew and make quilts! They'll always remember that experience! I love Montessori. 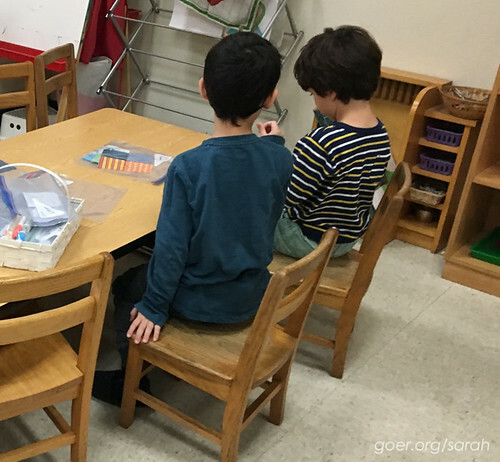 I went to a Montessori preschool and I think it was an excellent start to my formal education. Thank you for your kind words, Sandy. Ohmigosh! I have had that very same Ed Emberley book for about 25 years - what a fantastic way to use it!! You are super clever to think of it. I teach 10-11 year olds and am now thinking what a cool project to do...thanks for the idea! I hope you can continue to work with the classes so we can see more quilts each year. Those little painted squares would be an adorable fabric if they were all put together in a print! Kids are so artistic and capable of much more than we think in this arena. Thank you, Marji. I'm sure there will be more school quilt projects in my future. I love how nothing holds them back. They like it, they do it. There isn't usually any overthinking at this age. 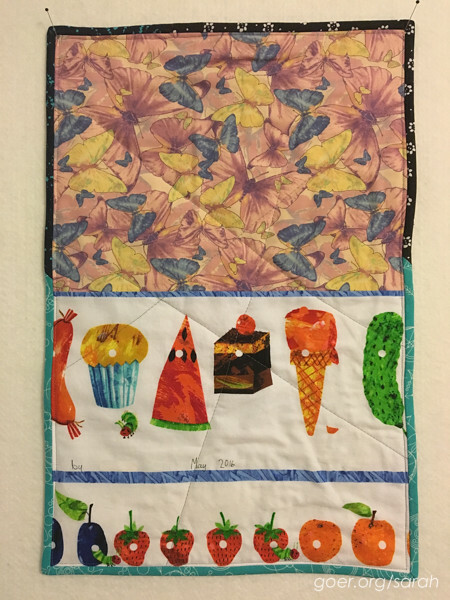 It always makes me happy when I see other children learning to sew, and to see how a quilt comes together. I'm sure you enjoyed this teaching opportunity and what a great feeling to see them succeed. These all turned out amazing. Great work! Great post and fabulous project. How wonderful that those who wanted to keep sewing got to see their interests through to a finished project. Great memories for all involved! Thank you, Tami. It all started when I said, "do you want some more fabric?" to the two who finished their class block fastest. I never imagined that it would end with two adorable mini quilts (that were this big!). Are you now inspired to do this with another group? Oh I love this!!! 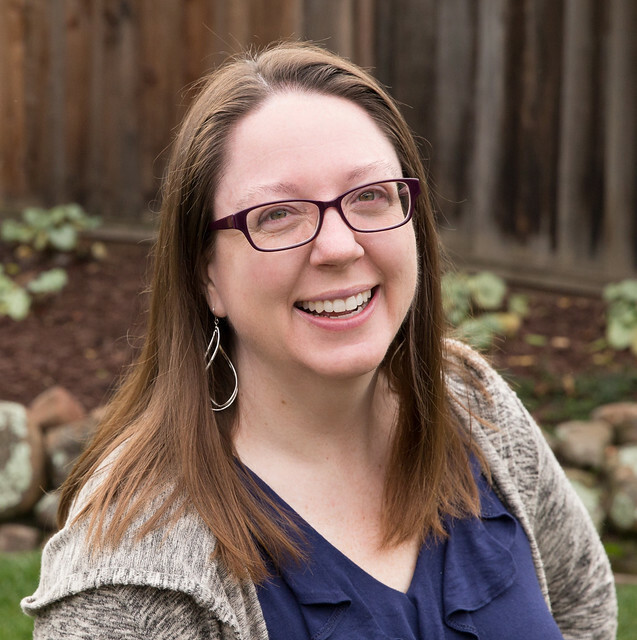 I'm a Montessori teacher and quilter. I am thinking of starting a yearly tradition of quilting with the kindergartners and exhibiting the quilt at graduation. Thank you, Carmen. I'm so glad you like this and will work it into your classroom. I'm working with the kindergarteners again this year since my daughters a kinder this year. The quilts from previous years hang in the classroom. Have fun and I'd love to see pictures!